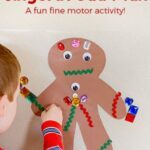 This gingerbread house shape craft is a great way for toddlers and preschoolers to learn shapes and colors, develop fine motor skills and more! 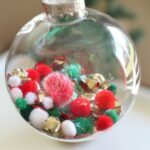 Lately, my two-year-old (28 months) has become more interested in doing crafts and activities. I am just starting to teach her about shapes, so I thought a shape craft would be perfect. Since it is the Christmas season, a gingerbread house made of shapes was just the ticket. 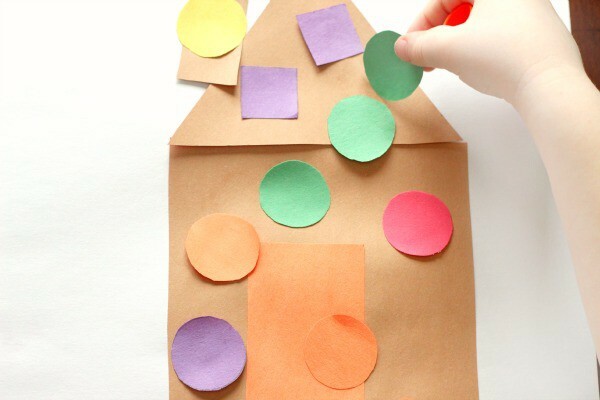 Construction paper in brown, red, green, and any other colors you would like. 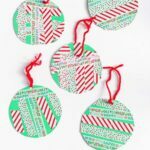 Foam shapes or foam shape stickers (alternate option) – These glitter stickers would be so pretty too! 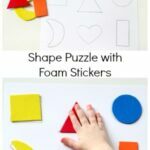 * If you are doing this in a classroom, I think it would be a great idea to buy foam shapes or stickers for this activity. 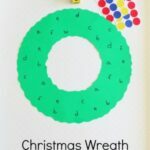 You would avoid cutting out so many shapes and peeling the backs off of the stickers is excellent fine motor practice! *If you don’t have the large 12 x 18 sheets of white construction paper, you could make your shapes a bit smaller than I did and use a regular sheet of white construction paper. 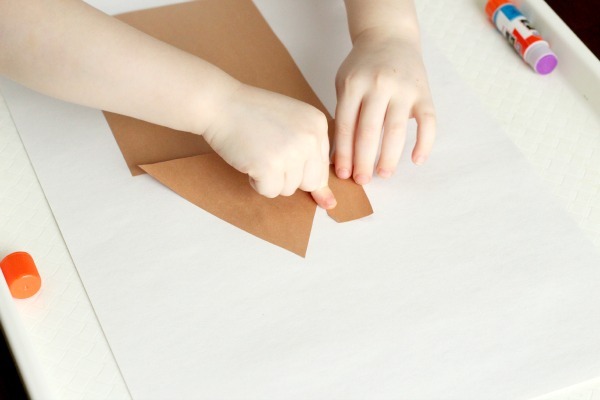 Draw a large square or rectangle and a large triangle on the brown paper. Add a small rectangle for the chimney. 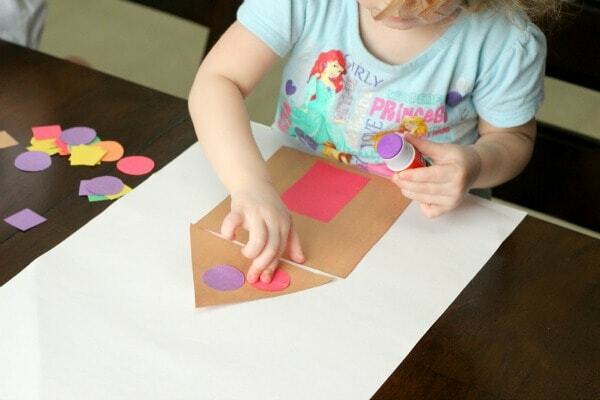 Draw several small squares and circles on one of the colored sheets of paper. I traced a small water bottle lid for the circles. 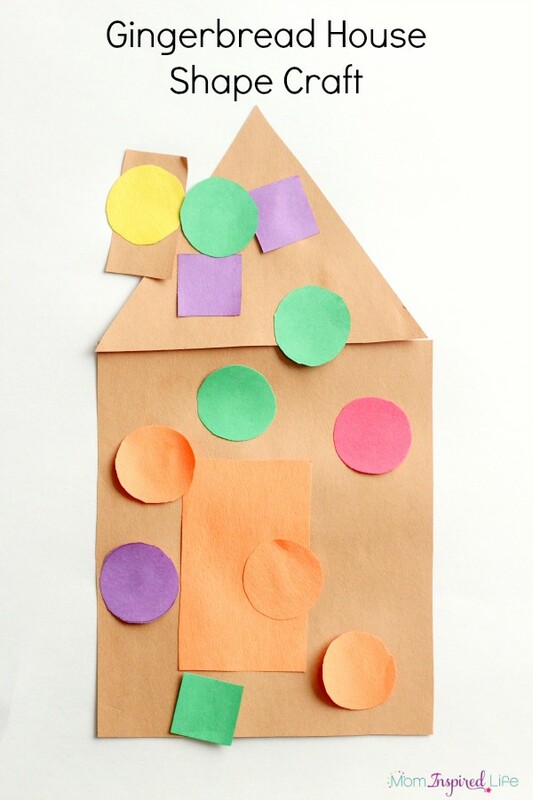 Stack the remaining sheets of colored paper below the one with squares and circles. 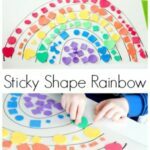 This is so you can cut out all of the colors at once and don’t have to cut out each sheet individually. Cut out the squares and circles. I placed the large sheet of white construction paper on the table and quickly showed my kids how they could combine the rectangle and the triangle to make a house. They grabbed the glue sticks and got started! My toddler wanted me to help her place the shapes on the paper, so I did. The rest of the time they both did everything else on their own. They loved putting glue on the shapes and sticking them down wherever they wanted. My toddler absolutely loved sticking the shapes down all over the place! My preschooler was more calculated about it. They both did an awesome job!